The seizure of an illegal weapons shipment late last month netted more than twice the number of smuggled automatic weapons originally estimated, the Navy announced. 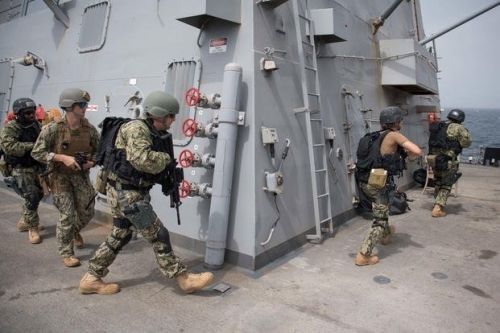 The guided-missile destroyer Jason Dunham boarded a stateless vessel in the Gulf of Aden Aug. 28 and captured the small arms shipment, initially estimated at more than 1,000 rifles. Officials with U.S. Naval Forces Central Command said the final tally totaled 2,521 AK-47s. It's still not clear where the shipment originated or where it was headed, officials said. "As a part of our counter-trafficking mission, we are actively involved in searching for illegal weapons shipments of all kinds," Vice Adm. Scott Stearney, commander of NAVCENT, U.S. 5th Fleet, and the Combined Maritime Forces, said. "Ensuring the free flow of commerce for legitimate traffic and countering malign actors at sea continue to be paramount to the U.S. Navy and its regional partners and allies."